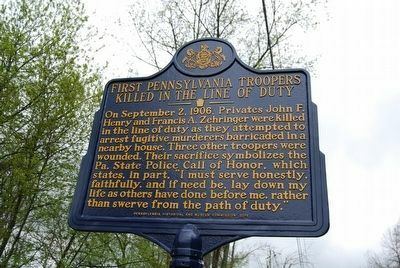 On September 2, 1906, Privates John F. Henry and Francis A. Zehringer were killed in the line of duty as they attempted to arrest fugitive murderers barricaded in a nearby house. Three other troopers were wounded. 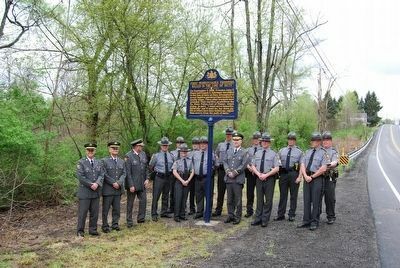 Their sacrifice symbolizes the Pa. State Police Call of Honor, which states, in part, "I must serve honestly, faithfully, and if need be, lay down my life as others have done before me, rather than swerve from the path of duty." Location. 41° 0.412′ N, 78° 57.449′ W. Marker is in Anita, Pennsylvania, in Jefferson County. Marker is at the intersection of Main Street (Pennsylvania Route 310) and Ash Street, on the right when traveling south on Main Street. Touch for map. Marker is in this post office area: Anita PA 15711, United States of America. Touch for directions. Rossiter Strike Injunction (approx. 7.7 miles away); Old State Road (approx. 9.9 miles away); Lewis Earle Sandt (approx. 12.1 miles away); Millstone (approx. 12.3 miles away); Elijah Heath (approx. 12.3 miles away). More. 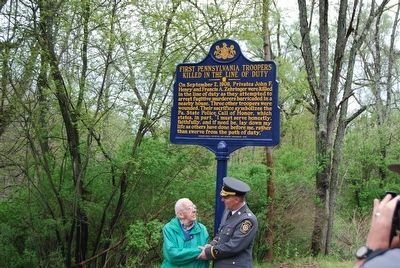 Search the internet for First Pennsylvania Troopers Killed in the Line of Duty. Credits. This page was last revised on June 16, 2016. This page originally submitted on May 2, 2016, by Mike Wintermantel of Pittsburgh, Pennsylvania. This page has been viewed 314 times since then and 13 times this year. Photos: 1, 2, 3. submitted on May 2, 2016, by Mike Wintermantel of Pittsburgh, Pennsylvania.